“Chakras” comes from the Sanscrit word for wheel. They are central energy points in the astral body. They are 7 major chakras. The first one is at the spine’s lower part and the seventh’s at the top of the skull. They are the junction of the nadis or astral ducts where the Prana, the Chi or vital energy runs. The chakras accumulates the Prana and the energy becomes more and more subtile as it raises from the lower chakra to the top of the head. In the oriental traditional imagery chakra is represented by a a lotus flower. This representation combined with the wheel symbolism gives the picture of a cercle shape turning on itself while the lotus flower petals are blooming one after the other. Each chakra has it’s own distinguished feature corresponding to a colour, an element, and precise physical and emotional fonction. Also, each chakra vibrates at it’s own particular frequency. The influence of chakras on our physical body’s health is explained by the principal that our astral body, where the chakras are, vibrates on a higher fequency than our physical body which is more dense. Disorders of the first one are expressed in the second by developing deseases. These malfunctions can reveal themselves either by the chakras’ shrinkage or their rotation speed slowing down, wich expresses an organ activity’s reduction, or by the chakra’s expansion, it’s speed rotation accelerating, due to physical and emotional issues. This last phenomena is obeserved on the solar plexus when the adrenal over works due to stress. The 7 main chakras corresponding to the 7 main endocrine system glands. Nadi means vibration or movement. Nadis are the astral ducts or meridians through which the vital energy runs in the astral body. There are 72000 of them. The most importants are Sushumna, Ida and Pingala. 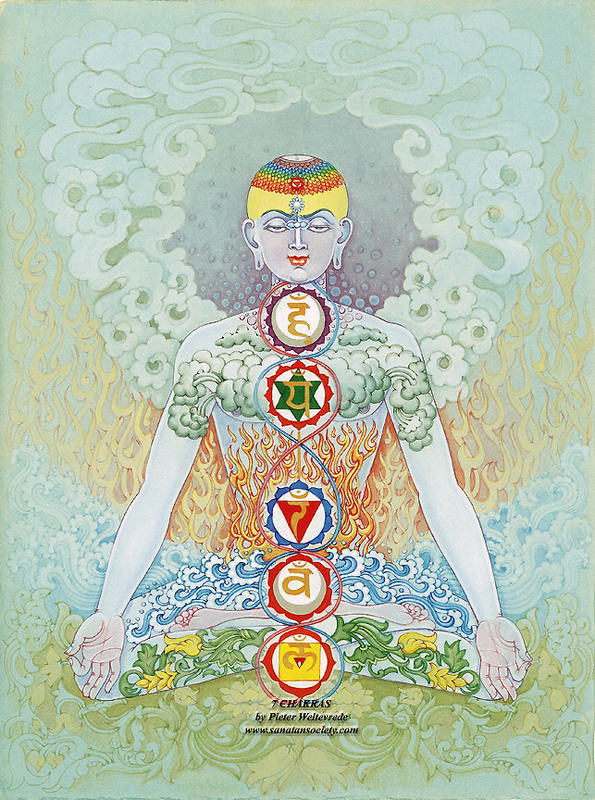 Nadi Sushumna (the cosmic fire) corresponds to the spinal cord in the physical body and through which the Kundalini rises – the latent spiritual energy or divine power – under the form of a curled up snake. Ida’s nadi is characterised by lunar energy. It calms and freshenes up. The starting point of this duct is on the left of the first chakra and ends in the left nostril. Pingala’s nadi is solar energy vector full of ardour and rush. The starting point of this duct is on the right of the first chakra and ends above the right nostril. Ida and Pingala’s nadis cross each other as they progress along the spine and their crossing points correspond to the chakras. The main chakras are formed at the junction of 21 nadis whereas the secondary chakras are formed at the junction of 14 nadis. Nadis purification is essential since it secures the Prana’s flow. 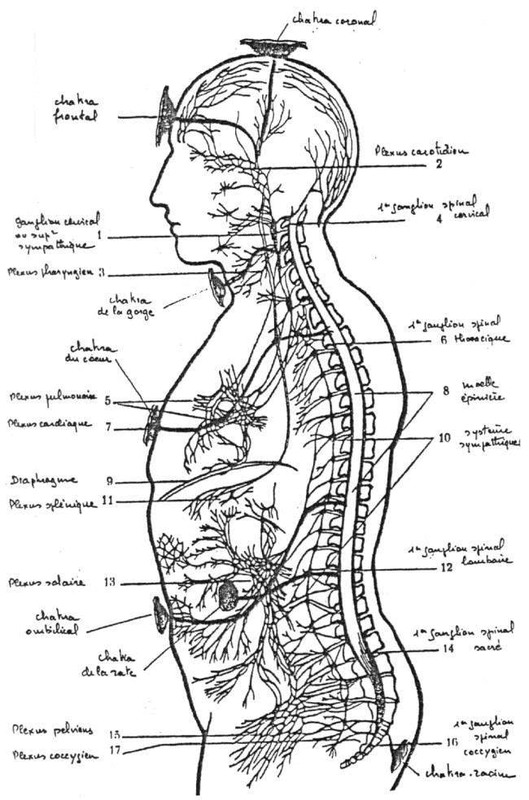 Any vital energy stasis in the astral ducts or meridians can indeed express itself by physical or psychological desease. Therefore, yoga as well as acupuncture, operate on nadis purification an strengthening. Pranayamas, a yoga breathing technic, helps the energy balance and flow. Devine energy has two aspects. One is assimilated by the first chakra and the other by the seventh, those two chakras being related by the main nadi called Sushumna. 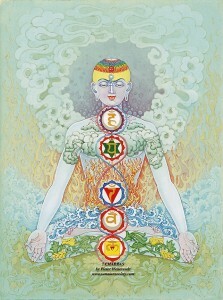 It’s from this first chakra and by the Sushumna duct that Kundalini’s energy rises. Kundalini’s strenght is the cosmic energy source of all creation, it represents the feminine aspect of god. The other divine energy form enters by the 7th chakra and flows through the Sushmna’s duct towards the chakras. Only a very little amount of energy runs through Sushumna for most people. When this energy is awaken or in movement, the more it flows in the central duct, the more the chakras will be effective. Kudalini’s energy transmits to each chakra the energetic vibration needed and allows the human being to reach all his abilities and active strenght within the energetic creation planes so that he can incorporate them in his life. Then, the human being experiments higher conscience levels, which allows the chakras to open wider, permitting a more powerfull access to the energy driven by Kundalini. The more this energy is strong and powerfull, the more actives are the chakras, therefore opening the access doors towards vast number of conscience levels. This chakra is located on the top of the head at the fontanel. It represents the human being’s highest conscience level. It is the center of illumination. When Kundalini reaches this level it doesn’t belong anymore to the human or animal conscience field, it is exclusively divin. It is the seat of pure consciousness. When Kundalini rises from the root chakra to Sahasrara, energy and consciousness unify and illumination arises. Under the influence of Anja chakra, the strength generated by their union is then sent back to its starting point through Sushumna to allow ourselves to experiment paradise on earth. When the crown chakra starts to open we are attracted by mystic and occult learnings. At this stage of our development, we sometimes start to grasp auras, to have a feeling of respect and amazement in front of the beauty and immensity of creation. We gain a global interior comprehension of the universal truths. When it is entirely open, this chakra units with the 3rd eye’s chakra to form the halo often represented around the saints’ and illuminated souls. – Balanced energy : Opening to divin energy, total access to unconsciousness and subconsciousness. – Excessive energy : Frustration and frequent migraines. – Deficient energy : Indecision, extinction of hapiness’ sparkle. – Physical disorder : Brain desease, migraine, endocrine system disorder, psychological disorder. 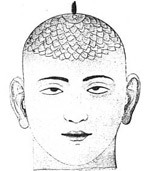 This chakra is located in the middle of the forehead, just above the eyebrows. Intuition is transmited from this chakra to the lower ones and to the mind. This is why Ajna is called the 3rd eye, the eye of intuition. It is the link between our superior consciousness and ego and between superior cerebral abilities and instinctive cerebral fonctions. Linked to the mind, this chakra is represented with 2 petals joined to the left and right pituitary and joined as well to the left and right brain hemispheres. The right hemisphere is the seat of intuition, the left is for intelligence. Here takes place the celestial marriage of the sun and moon, resulting in the opening of the 3rd eye and the evoluated 6th sens. The 3 main nadis, Ida, Pingala and Sushumna, unite here before rising to the crown chakra. The importance of the progressive opening of this chakra has to be noticed. The mastery and total balance of the lower chakra are an absolute necessity. Without a conscious control over the lower chakras when opening Anja chakra, various types of confusions appear. – Balanced energy : Detachment for material possessions, fear of death fades away, telepathy, clairaudience, clairvoyance, access to past lives. – Excessive energy : Pride, religiously dogmatic, manipulator and selfish. – Deficient energy : Hypersensitive to others feelings, lack of selfconfidence and inable to distinguishe the difference between ego and superego . – Physical disorder : headaches, sinus and eye disorder, inflammation, hay fever, insomnia, migraine and hormonal disorders. This chakra is located in the throat hollow. It is the center of communication, self expression and creativity. This is where you can hear your inner voice for it is linked to audition and to ether element or akasha. When it is awaken and purified it encourages telepathy and information’s distribution. Vishuddha is the door or bridge to higher conscience levels. It is associated to life and death. Transcending them is fulfilling the immortal and spiritual self staying a conscient individual. – Balanced energy : Centered, competitive, orator, eventually musician or painter, inspires an attraction for meditation and spiritual wisdom. – Excessive energy : Arrogance, selfsatisfaction, dogmatic character, overreactions. – Deficient energy : Scared, shyness, unconsistancy, not reliable, manipulator, scared by sexuality. – Physical disorder : Exhaustion, weight disorder, thyroidal disorder, throat ache, neck pain. – Meaning : Navel’s gem. This chakra is located above the navel. It is the center of physical energy delivery and digestion. It is associated to ego and astral and emotional body. It reacts to thoughts related to fears, anxiety and worries. For most people this chakra is always destabilized because of emotional disorders. Through this chakra we can sens others thoughts and emotions and eventually draw energy, consciously or not, from people we get in contact with. We can protect the solar plexus by viewing a golden cercle where it is located. – Balanced energy : Self respect and respect for others, open, happy, relaxed, spontaneous, confident, welcoming, attracted by physical activities. – Excessive energy : Tends to juge, workaholic, perfectionist and bitter towards authority. – Deficient energy : Depressed, unconfident, fears, bad digestion. 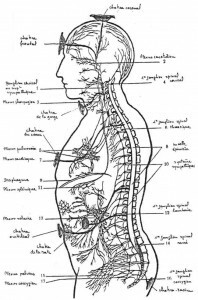 – Physical disorder : Muscles stiffness, nervous tensions, stomac and digestion disorder, diabetes, hypoglycemia, hepatic disorders, low vitality.